The fourth of our fifteen-part series of articles examining Thief II’s level and mission design sees Garrett on the back foot – betrayed and ambushed by the City Watch! It had to happen eventually; Garrett was on borrowed time from the moment Sheriff Truart initiated his clampdown on the City’s undesirables. That his fall should come after his most audacious endeavour yet shows that maybe fate has a sense of humour. Fortunately, Garrett is never unprepared, even when he’s supposed to be meeting one of his associates within the City’s criminal fraternity. Betrayed, with the City Watch filling the streets searching for him, Garrett is forced to escape and make his way back to the safety of his apartment. Ambush! isn’t structured like a traditional Thief level. There’s no specific location to infiltrate, no secrets to discover and the level itself is largely empty. 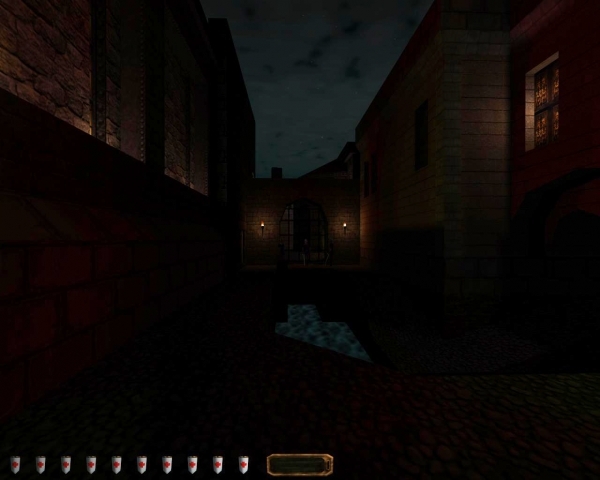 When Thief: Deadly Shadows moved to a city hub structure, technical constraints might have limited the size of each area to smaller than that offered by Ambush! but the objectives presented here would not have felt out of place. In a way, it doesn’t feel like an actual level so much as a means of moving the plot forward without resorting to a cutscene. As such, it can feel less substantial than those levels that came before. The physical space of Ambush! is also one of two layouts in the game that are repeated in different levels, with the return to this part of the City coming later in Trace the Courier. The other use of repeated space is more overt and can be found near the end of the game in the Casing The Joint and Masks couplet. Ambush! takes place within a portion of the City encompassing the Cripple Burrick pub, a small marketplace and Garrett’s home in the far northwest. It is this final location that is your initial objective. The Dark Project included a level where the expected was subverted within moments. Though the opening of Ambush! similarly has Garrett reacting to a dramatic change, the design of these two levels is different. An ambush with no way of avoiding it is a forced failure; a situation Thief tries its best to avoid, given the frustration that can occur from being confronted with a compulsory encounter. Being missed by an archer, and having to escape an ambush, both dramatically change the status quo but in different ways, ensuring that players don’t feel cheated by the latter is challenging. 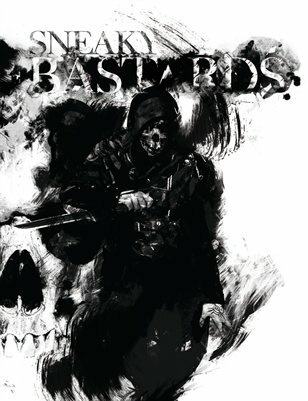 The start of Assassins sees Garrett in a position of strength, he is believed dead and can trail those who came to kill him. If Ambush! had opened with Garrett entering the Crippled Burrick, it would have started with him in a weakened position. By having the City Watch spring their trap within the briefing cutscene, Ambush! is able to open after Garrett has escaped the initial attack and is once again in a (however limited) position of strength. The need to be reactive and respond to the threat presented by the City Watch is still present from the moment you begin the level. A sense of tension and ill-preparedness is enhanced by being unable to purchase any equipment prior to the start of the mission. Contrary to Garrett’s initial assessment of the situation and recommendation to get moving, your starting position is dark enough that the two guards patrolling the street behind the Crippled Burrick will not be able to see you; though from here, you have a very limited view of the street and few ways to assess your current situation. Despite this initial safety, the area immediately surrounding the Crippled Burrick is a risky place to stay for any length of time. It’s dense with patrolling City Watch and the two exits to the north have been locked off with sturdy metal gates. It’s possible to raise the gate to Shalebridge Road, though gaining access to the necessary building from this side presents a significant challenge. Confined to the area around the Crippled Burrick, with a limited inventory and few avenues of escape, you are forced into reactivity where usually you can be proactive. Fortunately, the way out of this area also presents an opportunity to resupply; a small garden growing atop a wall between two buildings offers a chance to escape the immediate area of the ambush and restock with some water and moss arrows. Once away from the Crippled Burrick, the available options open up. There are many different routes to Garrett’s apartment and though there are still many guard patrols throughout this portion of the City, they are focused around specific locations and as such can usually be avoided by finding an alternate route. South of the marketplace, there are fewer City Watch and those you can encounter are standing guard over certain roads and intersections rather than walking a patrol route and can be easily avoided. Overhearing a conversation between two nobles south of the marketplace leads to the clearest indication yet that the City is not in so much in a “post-war” period but in an open and ongoing war with a distant enemy. With the Baron – presumably, given the context, the City’s head of state – away leading the war effort and the City under the “protection” of Sheriff Truart and his men, there are clear parallels to certain versions of the Robin Hood legend, with the Baron as Richard the Lionheart and Garrett a less altruistic take on Robin himself. The portion of the City west of the marketplace is largely empty, though that doesn’t make it safe. The streets twist and turn regularly, with dead ends, short sight lines and changes in elevation making it difficult to determine what is around the next corner, or on the far side of the wall you’re crouching behind. A canal runs through this area serving to split otherwise open spaces in two. With the bridges regularly patrolled, the canal can make moving freely through this part of the City difficult. At certain points it’s narrow enough to allow you to leap from one side to the other – but if you miss, finding somewhere to get back to street level can be hard as such opportunities are often guarded or in out of the way locations that require doubling back in order to reach your original destination. 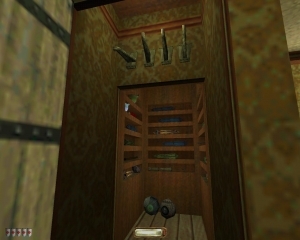 Garrett’s apartment, though small, can be entered from a variety points. The building itself can be approached from five different directions, one of the three streets arriving from the south and east or from within either of the two buildings directly south. Upon reaching Garrett’s home, it turns out not to be the safe haven it was when he left for the Crippled Burrick; the City Watch are already waiting. With three guards watching the front door and another two inside, it’s clear that, for somebody within the City Watch, the capture or elimination of Garrett is a high priority. When one of the City Watch guarding the front door questions the Sheriff’s desire to capture a “common thief”, his commanding officer takes pains to explain the Sheriff’s orders regarding the risk presented by Garrett and the need to bring him in “dead or alive”. As you will discover later, and as has been hinted at in the previous level, Truart isn’t exactly honest in his role as Sheriff. His extra legal activities are not a secret to his subordinates in the City Watch; some have even taken to openly discussing the people the Sheriff is working for, joking that once everybody else has been brought in they’ll have to arrest the Sheriff. His corruption is obvious even to them, though they can only speculate as to who the Sheriff is in cahoots with. Though you find out later that the Sheriff’s allegiance is to the Mechanists, it’s not spelt out explicitly that they are the ones behind the predicament Garrett now finds himself in. It could have been the work of Mosley – possibly present as the commanding officer of those on guard outside Garrett’s apartment – in an attempt to tie any loose ends surrounding the fate of her now presumably former colleague Lieutenant Hagan. Whoever is behind the ambush attempt, one thing is certain: this area of the City is no longer safe and it’s time to relocate. The best place to lay low is the Shalebridge district, a name that will be heard again in much more ominous circumstances in Deadly Shadows. 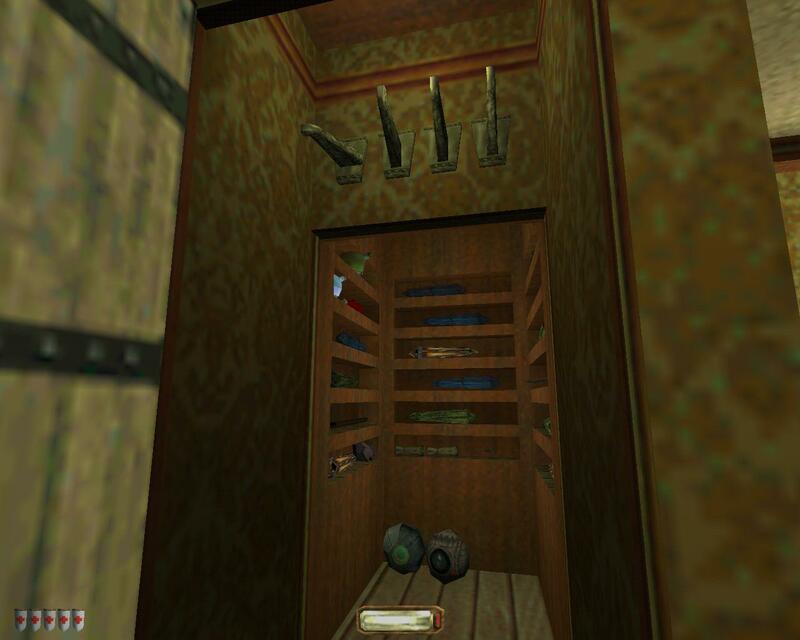 The humble walk-in wardrobe of a master thief. Note the secret lever position required to reveal it. The City Watch have locked down the road to Shalebridge. Fortunately, Garrett is prepared for such an eventuality and has a copy of the key for the old gate within the hidden compartment in his bedroom. With this in your possession, it’s time to abandon the apartment and escape this part of the City. Under normal circumstances, the shortest route from Garrett’s apartment to Shalebridge Road would be to head east, past the Graveyard. As part of the night’s events, the roads to the Graveyard have been closed down, meaning access to the eastern portion of the level requires some backtracking. If you can avoid the City Watch patrols to the south, a building on Helena Way has a rear door that will allow you to bypass the gate on Whipple Street north of the marketplace. East of the marketplace, the closer to you get to the old gate on Shalebridge Road – and, as a side effect, the Crippled Burrick – the more numerous and frequent the City Watch patrols become. To the west, it was not uncommon to find them walking in pairs; here, you will find points where overlapping routes cause stretches of street to be patrolled by three or more guards at once. Without the canal to divide them, the streets themselves are smaller and the buildings closer together, offering fewer hiding places. 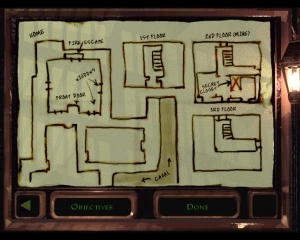 Fortunately, the number of buildings that are accessible also increases in this part of the level – though on Expert difficulty most, if not all, are locked. Where movement through the western half of the level was limited by blind corners and regular choke points, to the east the way forward is commonly achieved by avoiding the streets entirely and cutting through the buildings; bypassing the locked gates and waiting until the patrolling City Watch have walked past or below your hiding place before making a dash for the safety of the next building. Gates and other bottlenecks between different sections of the City are heavily guarded. If you can gain entry to it, the building to the left of this gate on Whipple Street contains a door onto the walkway above. In general, the levels in The Metal Age can be divided into two types: the closed and the open. In the former, there is a single specific location to infiltrate. This style of level is self-contained; most of the space within is accessible and all doors usually lead somewhere. In the latter, there is no single location; instead, there are usually multiple different buildings to enter. Because it is harder to contain such a layout, it’s not uncommon to find doors that are simply textures on the wall. Ambush! exemplifies the open approach to level design, while the previous mission, Framed, is a good example of a closed level. The benefits of the open approach are that a larger volume of space can be used, allowing for a stronger contextualisation of the level’s position within the world. In Ambush! you are in the City, whereas the isolated and self-contained nature of Shoalsgate Station means that it could be anywhere; it’s relationship to other locations in the City is difficult to ascertain. As the first open level you will have encountered, Ambush! has a feeling unlike the previous levels in The Metal Age. Its tempo is staccato, with long stretches of wandering in darkness punctuated with bursts of activity as you approach specific buildings or choke points. You will cover what feels like a large amount of space in a short period of time, and it can be easy to get lost, especially given the sharp corners and short sight lines of the streets to the south and east of the canal. The longer you spend exploring those streets, the more comfortable you become in them and the smaller the area seems. This portion of the City soon starts to feel familiar. Given that the level geometry is reused later in Trace The Courier, it feels to some extent like those two levels might have worked better had their position in the game been swapped. The narrative of each fits the order in which they appear, but given that Garrett is supposed to be responding to an ambush on his home territory, having personally explored that territory previously in a more structure fashion, as offered by Trace The Courier, would have benefited the conceit that Garrett is now being hunted through a space he knows – because you would know the space too. Another great installment! Thank you very much for writing this. As this game is (still) my favorite, I appreciate all of the effort you are putting into this. I especially like the call-out mentioning the on-going war. Once again the back story is where this game shines. This one overheard conversation opens up a whole area in your mind as to “what’s going on” out there in the world as you play. The Metal Age is quite cool and good-looking, I like it.